Lewis R. Jinks, 95, of New Boston, Illinois died Sunday, June 10, 2018 at Crest Care Center at Ridgecrest Village, Davenport, Iowa, where he had lived the past 6 years. Funeral services will be held at Dennison Funeral Home in Aledo, Illinois on Thursday, June 14th at 11:30 a.m., with visitation from 9:30 a.m. until the time of service. Burial will be in New Boston Cemetery, with military rites by Aledo American Legion. Following the graveside is a time of food and fellowship at the First Christian Church, Keithsburg. Memorials may be left for Keithsburg First Christian Church, Ridgecrest Foundation Koning Charitable Fund or New Boston Fire and Ambulance. Lewis Robert Jinks was born April 23, 1923 on a farm south of Viola, Illinois to Clarence and Barbara Smith Jinks. Lew attended Rock Island public schools until his senior year when his family moved, he graduated from Port Byron High School in 1942. After high school he went on to graduate from Worsham College of Mortuary Science. Lew entered the Army during World War II, serving in the South Pacific and Iwo Jima with the 147th Infantry. 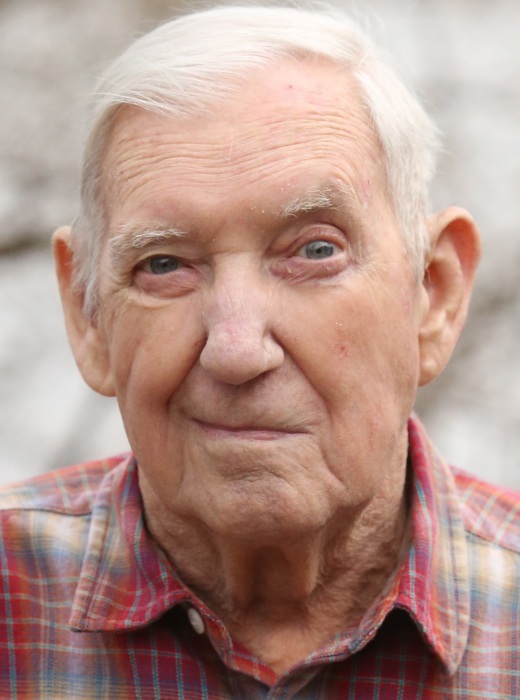 On March 7, 1948, he married Betty J. Clauson in Aledo. They were married for 62 years until Betty died on August 17, 2010. Lew was a licensed funeral director and embalmer, working for Larson Funeral Home in Rock Island for over 20 years. In 1980, the family moved to Joy, Illinois when Lew purchased the Olin Funeral Homes in Joy, Keithsburg and New Boston and the Crummy Funeral Homes in Viola and Reynolds. He then opened a funeral home in Aledo… all of which became Jinks Funeral Homes of Mercer County. A few years later, Lew and Betty moved to their cabin in New Boston where they spent many happy years overlooking the Mississippi River. Lew retired from funeral service in 1992. He was a member of the Aledo Masonic Lodge and Aledo Exchange Club. In his free-time he enjoyed golfing, boating, traveling and spending time with family and friends. Those left to cherish his memory are his daughters and sons-in-law: Elizabeth and Arthur Stewart of Round Rock, Texas and Kristen “Tina” Nelson-Boutros and Dr. Rami Boutros of Iowa City, Iowa; grandchildren: Kaden (Jillian Hennenfent) Nelson, Garen Nelson, Taven Nelson-Boutros, Laken Nelson-Boutros and Lilien Nelson-Boutros; best friend: Barbara Thede and many nieces and nephews. He was preceded in death by his parents, wife and siblings: Marjorie Jinks, Lawrence Jinks, Grace Brown, Wilbur Jinks and Dorothy Wright Prahl.